2. Spray a sheet of aluminum foil with cooking spray and place the trout filet in the center. Fold up all four sides of the foil. Season the trout with salt, pepper and lemon juice. 3. Melt butter in microwave-safe bowl, stir in fresh minced garlic and drizzle over the trout. Top with fresh minced parsley. 4. Fold the sides of the foil over the trout, covering completely, and seal into a closed packet. Place directly on oven rack and bake until cooked through, about 15-20 minutes. *You'll know it's done with you can flake the fish with a fork and the meat will be opaque. The Umpqua Valley has a special place in Scott's heart. He grew up fly fishing the North Umpqua River with his father and knew early on that someday he would move to the area to make wine and raise a family. Did you know? One of the things that makes the North Umpqua River so unique, is that it is home to both summer and winter Steelhead runs. This is special because there are very few Summer Steelhead runs left. Pretty cool, huh? The North Umpqua River possesses 31 miles of the most scenic flyfishing-only water in the Northwest. Right now, winter run steelhead are in the river, coming into the North Fork of the Umpqua River beginning in January, peaking in February and tapering off through the first part of March. We are huge advocates for catch and release for all wild steelhead, but do enjoy a hatchery fish every now and then. NOTE: You can tell if a fish has come from a hatchery because the adipose fin is clipped, making it legal to keep. Many people may not know how to properly pair wine with Steelhead, so in honor of this wonderful winter bounty that we're so lucky to have, we're sharing our favorite recipes and wine pairings to get the most flavor and enjoyment out of your Winter Steelies. Enjoy! Steelhead falls into the Meaty Fish categoriy, types of fish that are firm with a meaty and steak-like texture. For meaty fish, the best wine pairings are rich white wines with lots of flavor and even a few red and rosé wines. This this particular recipe, we recommend our 2015 Susan's Vineyard Pinot Noir. This wine's silky texture with sweet fruit is balanced enough not to overpower the sometimes delicate flavor in Steelhead and quenching enough to pair well with smoked fish recipes. My first visit to Italy started in the Piedmont region where the great Nebbiolo, Barbera and Dolcetto vines line the hillsides of Alba and Asti. While my focus was on wine, I could not help but notice the orchards of hazelnuts planted on the valley floor. They are everywhere and a big part of the agriculture of northwestern Italy. 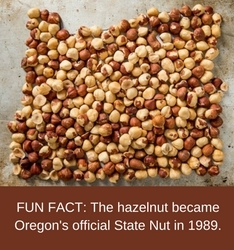 Fast forward 20years and I am now settled in Oregon where 99% of the countries hazelnuts are grown. I have always been fond of hazelnuts as a snack but was amazed at the diversity of uses. My wife often makes macaroons or shortbread cookies with the ground up flour, we have crusted a local Elk tenderloin with chopped hazelnuts as well as crusted halibut. However my all time favorite has to be Nutella. Chocolate mixed with pureed hazelnuts makes chocolate and peanut butter seem like yesterday's news. 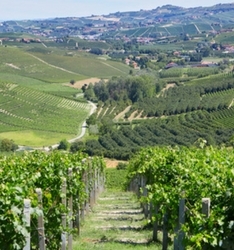 Wine grapes line the hillsides overlooking a valley of Hazelnut groves in the Piedmont region of Northwestern Italy. I first came across Nutella while working in Italy during the Christmas season. Every year Florence hosts an amazing Christmas market in the Piazza Santa Croce. All around the market street food vendors line up to serve the captive audience. After having a Gyro from a Turkish food cart, I happened upon a crepe maker. Standing in the cool December night I ordered up the owners favorite, his choice. He made a perfect light pancake filled with this nutty chocolatey sweet stuff called Nutella. I was hooked. To this day it is one of my favorite food memories. With all the local hazelnuts in Oregon, we have the opportunity to try a lot of recipes. Here is a recipe for making your own "Nutella". If you can't find Oregon grown hazelnuts I am sure it will still turn out OK, but be sure to tell your grocer they are missing out. Spread hazelnuts in a single layer on a baking sheet and toast them in the oven for about 12 minutes, until they've browned a little and the skins are blistered a little. Wrap them in a kitchen towel and rub vigorously to remove as much loose skin as possible. (Some skin will cling to the nuts when you're done. It's okay - not to mention inevitable.) Let cool completely. 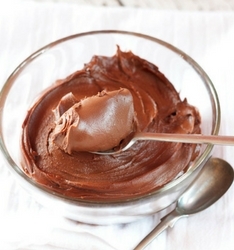 Melt the chocolate in a saucepan over gently simmering water or in the microwave. Stir until smooth. Let cool completely. In a food processor, grind the hazelnuts until they form a paste. Add the oil, sugar, cocoa powder, vanilla, and salt and continue processing until the mixture is as smooth as possible - or as smooth as you like. Add the melted chocolate, blend well, and then strain the mixture to remove any chunks of hazelnut that remain. The resulting homemade Nutella will be thin and somewhat runny and maybe even a little warm but it will thicken as it cools. Transfer to a resealable container and let cool to room temperature. 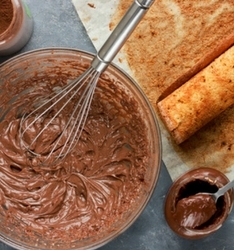 Your homemade Nutella will keep on the counter for up to 2 weeks.